A guest blog by our partners at Human eSources. 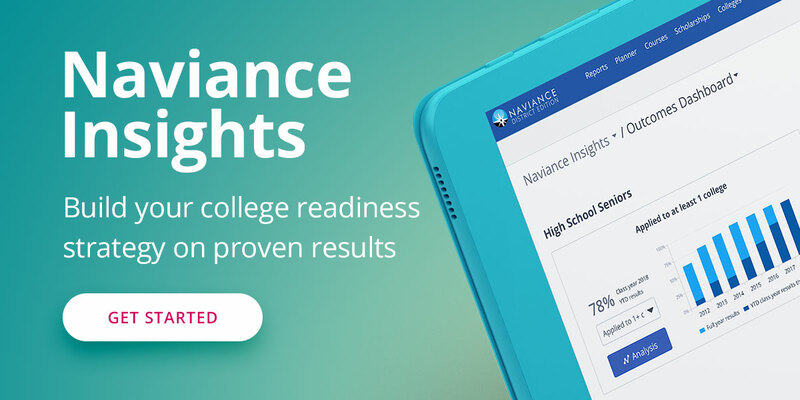 The AchieveWORKS assessments are available as a Naviance extension. I’m always receiving questions from educators about how they can use AchieveWORKSTM to help their students achieve higher levels of performance and satisfaction. The AchieveWORKS assessments help students understand themselves in three areas: personality type, learning styles and unique intelligences. Here are four ways that AchieveWORKS can enhance your counseling programs and improve student performance. AchieveWORKS assessments, when used in concert with one another, can provide students with a comprehensive foundation of self-awareness. No one assessment can reveal enough information to really help understand a person. In AchieveWORKS, there are three assessment tools that can be used with students to help them establish a solid understanding of their unique strengths and interests. Do What You Are® focuses on personality type, which is really about behavior and personal values. The Learning Style Inventory provides insight on environments and situations where students are most productive and receptive to learning. MI AdvantageTM digs deeply into cognitive patterns that reveal a student’s inclination for certain skills and knowledge. The three assessments together paint a more holistic picture of who the student is, areas to develop, and the best ways for that student to go further in school, her career and anywhere else she wants to see success. AchieveWORKS can help promote a culture of student-centered learning. There are certainly a lot of assessments out there, even some that look at similar traits. However, I think our tools do the best job of being student-centered. They’re designed to help students become more self-aware and empowered to act on their own, rather than assist the professional in interpreting and providing some kind of intervention on behalf of the student. This distinction is based on the clear advantages of individualized learning over personalized learning. We know that when students take more responsibility for their learning, it leads to deeper and more enjoyable learning. AchieveWORKS can address the ASCA Mindsets and Behaviors pedagogy. If you are implementing the American School Counselor Association’s Mindsets and Behaviors into your curriculum, we have put together an easy-to-follow map on how the AchieveWORKS tools can help your students achieve each of the ASCA Mindsets and Behaviors. At the highest level, this map allows you to determine which assessment and what parts of AchieveWORKS to use and when to use them. However, there’s a lot to the ASCA model, and it’s easy to become overwhelmed with all that is to be accomplished. AchieveWORKS can help you address many of the outcomes in the model through a personalized approach to student learning, so the student takes more responsibility for developing the skill. I also believe the student would benefit by seeing the map, as it would allow them to choose what areas they want to address first and also serve as a roadmap to help them track the standards they have, or have not, addressed. AchieveWORKS reports can empower students and help track progress. It’s important to remember that the AchieveWORKS reports provide the student guidance on how they might demonstrate a standard or outcome in a personalized way. Make a plan. Use the ASCA map to collaborate with your colleagues and students on a plan to approach AchieveWORKS one section at a time. Have your students complete the assessments on their own time, and then have them leverage the reports. Empower your students. Let them make choices about the plan: what they want to focus on and how they will demonstrate progress. Find the overlap. Much of the advice and direction provided by the reports in AchieveWORKS relate to activities that students are already doing. Students should be able to connect what they are already doing with social emotional learning, soft skills, career planning and other co-curricular areas. Follow up. AchieveWORKS has reporting capabilities for you to see student progress on their plans. Make sure you build a few checkpoints throughout your program to measure and celebrate student progress. I often yearn for those days I spent in the classroom with students, but helping school counselors enhance their counseling programs with AchieveWORKS brings me back to my passion. I hope you and your students find AchieveWORKS a valuable resource in helping them develop the valuable personal insight and awareness that will lead to more enjoyment and satisfaction in school and in life. Interested in hearing more from members of the AchieveWORKS team? Check out this webinar on how to use AchieveWORKS to personalize the ASCA competencies. And, register for Naviance Summer Institute to meet them in person. They will be presenting on how to make sense of AchieveWORKS reports in Naviance.